Rai came under fire last Friday from the opposition March 14 parties but won praise from March 8 politicians for indirectly defending Hezbollah’s arms and linking the party’s arsenal to the termination of Israeli occupation of Lebanese territory and the return of Palestinian refugees to their homeland . Even MP Walid Jumblatt who defected from March 14 alliance was very critical of Rai’s statements. He added that Syrian President Bashar al-Assad is “open-minded” and should be given more chances to implement the reforms he already announced. The opposition March 14 parties, including former Prime Minister Saad Hariri’s Future Movement, have launched blistering campaigns against Hezbollah, calling on the party to hand over its arms to Lebanese authorities. They also accused Hezbollah of running its own mini-state at the expense of state authority.“The state, and not any other Lebanese party, is responsible for defending Lebanon. It is the state that takes charge of forcing Israel to leave Lebanese territory and not any Lebanese party,” Soueid said. “Therefore, the [Lebanese-Syrian] borders must be demarcated. This demand had been unanimously approved at the National Dialogue [conference] in 2006,” Jumblatt said. “While affirming the defensive significance represented by the resistance’s arms, it is essential to draw up a defensive plan through which [Hezbollah’s] arms are gradually accommodated in the framework of the Lebanese state as provided for by the  Doha Accord in order to bolster the Lebanese state’s capability to confront any possible Israeli aggression,” Jumblatt said. Meanwhile, French Ambassador to Lebanon Dennis Pietton described Rai’s visit to France as “successful,” but expressed regret that the patriarch’s statements on Syria and Hezbollah’s arms had caused divisions among the Lebanese. Speaking to reporters after meeting Prime Minister Najib Mikati at the Grand Serail last Tuesday , Pietton said Rai’s visit to France was “important” during which the patriarch met a number of French officials, including President Nicholas Sarkozy, to discuss Lebanese-French ties, the popular uprisings in the Arab world, including the situation Syria, the STL and the work of the United Nations Interim Force in Lebanon. “But we regret that the patriarch’s visit had aroused this quantity of debate over his statements … We regret that this visit, which was successful and gave the patriarch a chance to express his opinion, had touched off this debate and divisions among the Lebanese in the Lebanese political arena,” Pietton said. Well maria-h, with all those ‘robed wonders’ walking around, that’s why it became a ‘Confessional Parliamentary Democracy’ … you can confess all the sins after you commit them and everyone will be happy … with the only problem being that some of the robed fatheads don’t believe they need to confess anything to anyone because they think nothing they do is a sin … which is why it doesn’t work. Sleiman what a challenging president ,any speech that made a thunder 🙂 ,any achievement beside selling lives of soldiers in Nahr el bared to become president. El Zaiitrie are stealing lands beside his Amchit hometown and no word from him. As Mikati revealed talks in Wikileaks , Soleiman told him ,I thought the presidency is hard it turned out to be so easy, For sure easy when you have fun travelling to UN to do nothing, going to meet the Patriarch now for what to meet him, does the Patriarch need your support or you actually the one who needs it your visit to him because you like his opinion about Syria and Hizbollah, because you are like the previous Lahoud just a bus boy to Nasrallah and Assad ,un homme banale , with no fire , but inside a dictator , showing your muscles on Lebanese forces only . Soon we will be done with you and all military who dreams to become president. This institution need tons of Javex to clean it !!! if the patriarch does not need anyone to defend whay are you opening your mouth and commenting on the mistake the rai made? sulaiwoman’s speech puts the patriarchi more in embaressment i reckon. 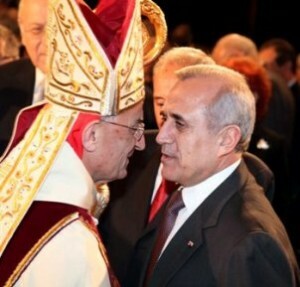 anyway, the patriarch has corrected his stances…can anyone tell president sulaiwoman that. Rai may be a religious man but he is praying to the wrong God,much like Oun..